Why do I have it? I enjoyed the first two books in the series (albeit a long time ago), and I needed an audiobook that I could count on to be engaging. Summary: Peter and Molly thought that they and the Starcatchers had defeated Lord Ombra at Stonehenge. Peter, imbued with enough of the starstuff’s power that he can fly, and no longer ages, has returned to Mollusk Island, and Molly has gone back to London. However, Lord Ombra is not gone, and upon his return he orchestrates the kidnapping of Peter and the Lost Boys from the Island. They’re headed for the desert court of the King of Rundoon, where Peter will be forced to play an integral part in Ombra’s plan, a plan with dire consequences, not only for Peter and his friends, but for the whole of humanity. Molly races to save him, but can she possibly get there in time? Review: I’m almost certainly biased by my love of Peter Pan stories (Peter was the first boy I ever had a crush on, and it’s never entirely gone away), but I find the Starcatchers books incredibly charming and fun, and this one was no exception. It’s been four years since I listened to the first two books, but this book immediately immersed me back in the Victorian London of the Starcatchers, and reminded me of what had happened in the previous stories without unnecessary repetition. The book is packed with plenty of action and adventure, and keeps the plot for the most part moving steadily along; there is a subplot involving Mollusk Island being invaded by a tribe of brutal hunters known as the Scorpions, which comes into play nicely at the end, but distracts from the main storyline during most of the book. I also thought there a nice range of humor throughout; there are some jokes that are clearly aimed at the younger end of the target audience (the flying, pooping camel comes to mind), but there’s also some subtle snarky humor that should appeal to more mature readers. But really, my favorite part about these books is the way that they pick out various parts of the familiar Peter Pan story, and fill in the backstory in such a way that it’s both clever and plausible. (Well, plausible given that one accepts the existence of Starstuff.) There are a number of such things that get explained in this book – the crocodile swallowing the clock, for example – but my favorite was watching the developing tension surrounding Peter and Molly’s relationship: Tinkerbell’s possessive jealousy, the enmity and posturing between Peter and George Darling, and the play of emotions as they all realize that Peter is never going to live the life of a normal boy. It’s all handled very well, and with more depth than you might expect given the age of the intended audience. Jim Dale, unsurprisingly, does a lovely job with the narration; I picked this book up in large part because I needed a narrator that I could rely on to be good. But I have to admit that there were points when Peter Pan sounded distractingly like Harry Potter, and Molly got more than a little Hermione-ish in places. Plus, who would have thought the word “dungbombs” (see above re: the camel) would have come up in more than one book? 4 out of 5 stars. 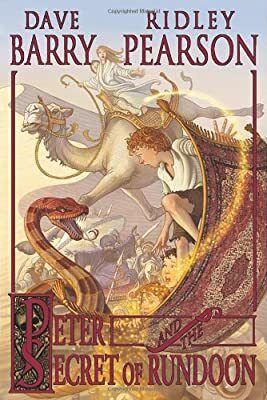 Recommendation: Peter and the Secret of Rundoon is not a standalone, but the series as a whole is definitely recommended for anyone who grew up (or is growing up) (or will never grow up) loving Peter Pan and wanting to run away to Neverland. First Line: The old man trudged along the dirt path, pulling his worn coat tighter to ward off the cold wind moaning across the Salisbury Plain. I have been curious about this series, but still haven’t actually tried it… I am glad you are continuing to enjoy it! I loved the first two books in this series, but the third one didn’t sound very appealing to me. I may have to re-add it to my TBR pile again soon.